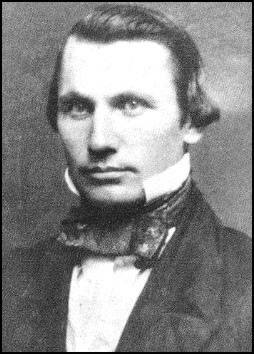 James Ewell Brown "Jeb" Stuart (February 6, 1833 – May 12, 1864) was a United States Army officer from the U.S. state of Virginia, who later became a Confederate States Army general during the American Civil War. He was known to his friends as "Jeb", from the initials of his given names. Stuart was a cavalry commander known for his mastery of reconnaissance and the use of cavalry in support of offensive operations. While he cultivated a cavalier image (red-lined gray cape, yellow sash, hat cocked to the side with an ostrich plume, red flower in his lapel, often sporting cologne), his serious work made him the trusted eyes and ears of Robert E. Lee's army and inspired Southern morale. 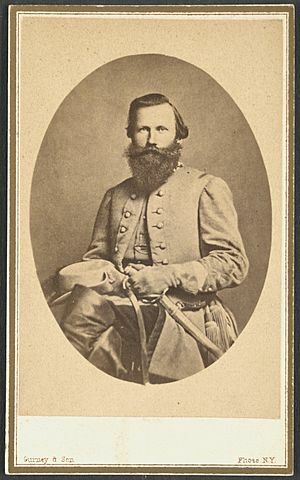 He resigned when his home state of Virginia seceded to serve in the Confederate Army, first under Stonewall Jackson in the Shenandoah Valley, but then in increasingly important cavalry commands of the Army of Northern Virginia, playing a role in all of that army's campaigns until his death. He established a reputation as an audacious cavalry commander and on two occasions (during the Peninsula Campaign and the Maryland Campaign) circumnavigated the Union Army of the Potomac, bringing fame to himself and embarrassment to the North. At the Battle of Chancellorsville, he distinguished himself as a temporary commander of the wounded Stonewall Jackson's infantry corps. Arguably Stuart's most famous campaign, Gettysburg, was marred when he was surprised by a Union cavalry attack at the Battle of Brandy Station and by his separation from Lee's army for an extended period, leaving Lee unaware of Union troop movements and contributing to the Confederate defeat at the Battle of Gettysburg. Stuart received significant criticism from the Southern press as well as the postbellum proponents of the Lost Cause movement, but historians have failed to agree on whether Stuart's exploit was entirely the fault of his judgment or simply a result of bad luck and Lee's less-than-explicit orders. A high school on Munson's Hill in Falls Church, Virginia, opened in 1959, and a middle school in Jacksonville, Florida are named for him. In December 2006, a personal Confederate battle flag, sewn by Flora Stuart, was sold in a Heritage Auction for a world-record price for any Confederate flag, for $956,000 (including buyer's premium). The 34-inch by 34-inch flag was hand-sewn for Stuart by Flora in 1862 and Stuart carried it into some of his most famous battles. 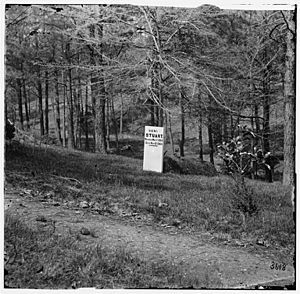 Stuart's birthplace, Laurel Hill, located in Patrick County, Virginia, was purchased by the J.E.B. Stuart Birthplace Preservation Trust, Inc., in 1992 to preserve and interpret it. J.E.B. Stuart Facts for Kids. Kiddle Encyclopedia.